﻿ Affiliate Program! Ecard Greeting System and so much more! Enjoy Ecard Greeting Profits... Join Our Affiliate Program Today! An ecard greeting application product is not all that exciting on its own. 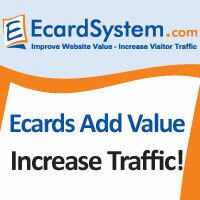 However, when you add to it all the services, tools and resources that EcardSystem.com provides – all of a sudden it become very exciting to webmasters everywhere! Now you can get paid by helping other website owners improve the overall quality of their website and increase the amount of targeted traffic they receive. How, you ask? Simple. Become an EcardSystem.com affiliate by taking just a few minutes to Sign up with CLICKBANK, the same company that we utilize to processs all of our subscription sale transactions. As soon as you sign up with CLICKBANK, you will be asked to choose your own account name (affiliate ID). Now you are able to begin making money selling our Ecard System - or any other product that you see in the CLICKBANK marketplace. Alright, assuming you have your new CLICKBANK account set up, next you will need to place our Ecard System product link on your website or newsletter. The link will include your new Affiliate ID. Now, here's the really great part of being one of our affiliates! For each referral you send to us that converts into a new Ecard greeting subscriber, you will receive 45% of the quarterly subscription price. THE BEST PART? You will continue to receive quarterly payments for the life of the subscriber! Our quarterly subscription rate is $14.85. So you receive $6.68 every quarter for that one subscriber, which may not sound like a lot at first, but wait until you calculate a little bit of volume into the equation. I Expect To Earn Each Quarter?" Well, the truth is... ONLY YOU CAN ANSWER THAT. 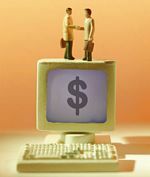 The amount of ecard greeting affiliate income that you earn each quarter is totally up to you. Your results will be directly related to your commitment and the quality of your sales strategy. One thing we can say with certainty is that if you think you can simply slap together a one page website and earn thousands overnight, you're bound to be disappointed. However, if you're serious about building an alternative source of revenue and you are willing to put in some time and effort to do things the right way, then you CAN earn substantial dollars, $100's or $1000's, each and every month. There is no ceiling on your potential here. Since your will earn an impressive 45% of the quarterly subscriber fee for the life of the subscription, that means you earn $26.72 per sale, per year! NOTE: Keep in mind that this is based solely on the Ecard System subscription price only. This does NOT include the additional cross-selling opportunities that will be forthcoming as we continue to add additional products to our site. Okay, now let's do some FUN MATH! So, as you can now see... it really is totally up to you as to how much, or how little, money you earn. The best part about our ecard greeting affiliate program is that once you make one sale, it continues to earn you money each quarter for the entire life of the subscription... Not too shabby, eh? Below we have provided some affiliate banners to help you increase your ecard greeting subscription sales. Enjoy! Join us today! Begin earning passive income. If any of the above information is unclear and you have additional questions, we invite you to Contact Us. We’ll do our best to help you get started. Start getting paid today! Earn money simply by assisting other webmasters add our ecard greeting application; improve the quality of their website and increase their targeted traffic. Return to Home Page...from Affiliate Program – ecard greeting page.